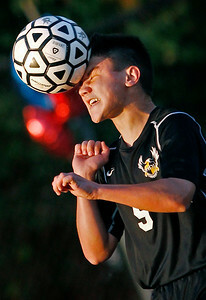 Matthew Apgar - mapgar@shawmedia.com Nicholas Voss of Jacobs connects with a header during their boys soccer game against Dundee-Crown on Tuesday, Oct. 13, 2015 at Dundee-Crown High School in Carpentersville. Jacobs won the game 3-1. 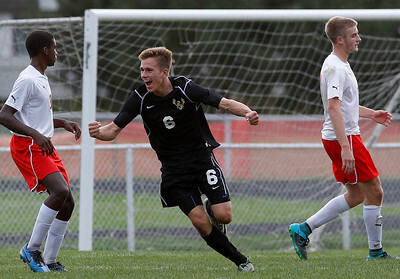 Matthew Apgar - mapgar@shawmedia.com Noah Melick of Jacobs, center, celebrates a goal against Dundee-Crown during their boys soccer game on Tuesday, Oct. 13, 2015 at Dundee-Crown High School in Carpentersville. Jacobs won the game 3-1. Matthew Apgar - mapgar@shawmedia.com Jacobs goalie Ethan Pickering dives to save a goal during their boys soccer game against Dundee-Crown on Tuesday, Oct. 13, 2015 at Dundee-Crown High School in Carpentersville. Jacobs won the game 3-1. 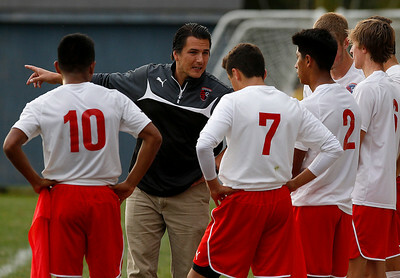 Matthew Apgar - mapgar@shawmedia.com Dundee-Crown coach Sebastian Falinski talks with his starters in the first half of their boys soccer game against Jacobs on Tuesday, Oct. 13, 2015 at Dundee-Crown High School in Carpentersville. Jacobs won the game 3-1. 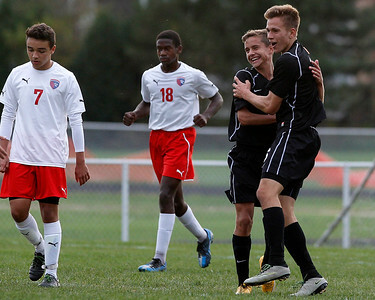 Matthew Apgar - mapgar@shawmedia.com Jacobs' Coin Walsh, second from right, hugs Noah Melick, right, after Melick's goal during their boys soccer game against Dundee-Crown on Tuesday, Oct. 13, 2015 at Dundee-Crown High School in Carpentersville. Jacobs won the game 3-1. 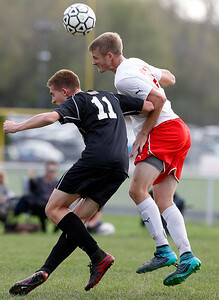 Matthew Apgar - mapgar@shawmedia.com Dundee-Crown's Johnathan Reese, right, goes up for the header with Konrad Wasilewski of Jacobs during their boys soccer game on Tuesday, Oct. 13, 2015 at Dundee-Crown High School in Carpentersville. Jacobs won the game 3-1. 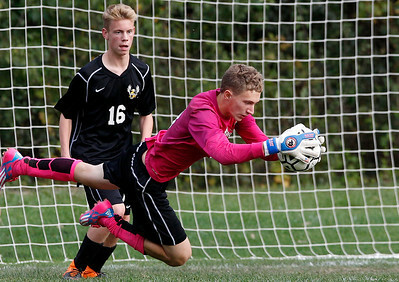 Jacobs goalie Ethan Pickering dives to save a goal during their boys soccer game against Dundee-Crown on Tuesday, Oct. 13, 2015 at Dundee-Crown High School in Carpentersville. Jacobs won the game 3-1.